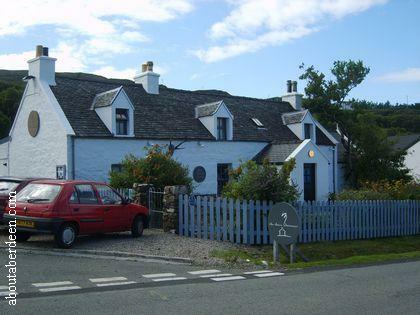 Ask most people Where To Eat on the Isle Of Skye and most will mention the Three Chimneys restaurant and inn. Aboutaberdeen have heard much about this world famous restaurant and after watching Nell Nellson on ITV having a wonderful meal during her programme The Woman Who Ate Scotland we had to experience this fine Scottish cuisine for ourselves. We were certainly not disappointed and consider our dining experience at the Three Chimneys to be one of the finest meals we have enjoyed in Scotland. Perhaps it would be more accurate to say worldwide. It's not just the delicious taste of the food but they way each dish is artistically displayed on plates and the attentiveness of the waiters and waitresses that gives such a unique dining experience. Even the plates at the Three Chimneys restaurant are unique and made from slates. Often when a restaurant is highly recommended and has a high worldwide reputation diners can be put off thinking the staff will be pretentious or that the dining experience is beyond them. But not so at the Three Chimneys restaurant on the Isle of Skye. The staff were smartly dressed in suits and ever so shiny shoes - but were down to earth and took a great deal of trouble over our meal, explaining each dish and making recommendations. Our meal choices are described in further detail in the Three Chimneys restaurant review section. One waiter even washed out the shell fish for a child who ordered the sea food platter so that he could add the oyster shells to his collection. 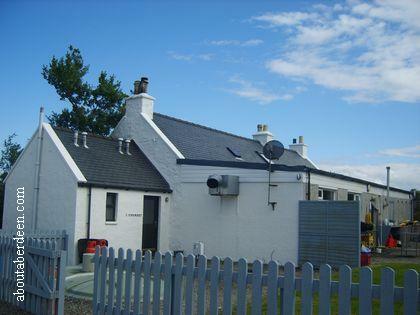 The Three Chimneys restaurant can be found at Colbost on the Isle of Skye on the B884. It is about 20 minutes drive from Dunvegan Castle which is well worth a visit. When driving to the Three Chimneys there is a sign post on a bend that is set back on the road. Don't take the left turning but follow the road. If you get to a farm and dirt track you've taken a wrong turning! 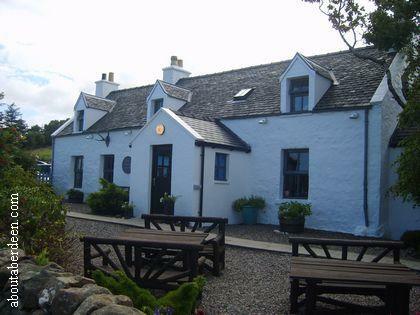 The Three Chimneys restaurant is in a small village next door to an old fashioned croft building and experience called the Colbost Croft Museum. There is plenty of free parking at the Three Chimneys restaurant and at the building next door which is the Three Chimneys hotel accommodation and offices called The House Over-By. 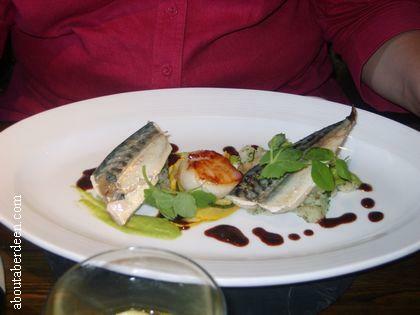 It is highly recommended that you book a table for the Three Chimneys restaurant on the Isle of Skye. 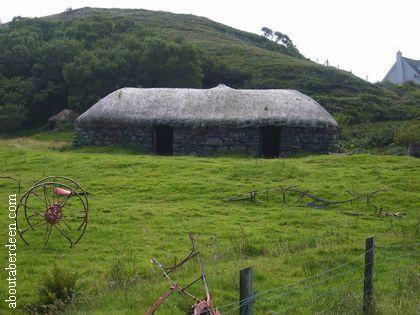 You will be asked for a contact telephone number, where you are staying on the Isle of Skye and a mobile number. You will then be asked to confirm your reservation on the day of your booking to secure your table. This is because there are only about a dozen tables at the Three Chimneys restaurant and the chefs and owners want to ensure each table is booked to avoid disappointment. From talking to locals on the Isle of Skye it seems that the Three Chimneys restaurant on the Isle of Skye has a reputation as being a wee bit expensive. Aboutaberdeen.com would argue that you do not get a fine meal and dining experience without having to put your hand into your pocket! The tables at the Three Chimneys restaurant are highly decorated in sharp contrast to the minimal decoration on the walls or in the rooms. The Three Chimneys restaurant is a former inn and the walls have been whitewashed to highlight the rustic wooden beams and windows with jugs on the window sills and open fires which add to the charm of this restaurant. The cutlery had been highly polished with no dishwasher water stains like in most restaurants and the plates and glasses spotless. Window seats give some great views across Loch Dunvegan and for warmer days there are wooden benches and tables outside. Buy the Three Chimneys Recipe Book. The restaurant is split into three area affording a degree of privacy. No music was played during the www.aboutaberdeen.com Three Chimneys restaurant review so conversations could be overheard. We are pleased to say all were complimentary of the food and we overheard fellow diners discussing their dishes so we knew which to order. Those who arrive early for their table can enjoy a pre dinner drink at the intimate bar. When we were seated we were offered still or sparkling water to drink. We choose a refreshing Gleneagles bottle of sparking water called Under the Rainbow. This was complimentary. We were then offered a choice of freshly baked and still warm bread rolls including granary with rosemary or pumpkin seeds. Our first experience of some charming slate dishes was seen when one was used as a butter dish. Shirley Spear, owner and chef of the Three Chimneys, Isle of Skye, has contributed two recipes to the book Taste Ye Back: Great Scots and the Food That Made Them which are her famed wholemeal cheese scones and neep bree recipes. Shirley Spear also discussed her favourite childhood food and meals. Choosing from the menu is not hurried and in-between courses we were offered the opportunity to sit and relax and take time before our meals were brought out. Though lunch closes at 2pm the restaurant was still full at 3pm with no sign of being rushed. The prices are set at the Three Chimneys restaurant and for this review we choose different meals, though we all could not resist the same starter.  For a three course meal aboutaberdeen were charged �32 and a two course meal would have been �25. Alcoholic and soft drinks were reasonable at �2.50 for a fruit juice and �4.95 for a Martini and lemonade. The Aberdonian in me wanted to shout How Much!!" when we were charged �4 for a cup of coffee and another �4 for a cup of tea. However they did include four pieces of the most delicious tablet we have ever tasted. The Three Chimneys tablet was lovely and crunchy and then melted in the mouth without leaving a sugary coating in the mouth like some tablet. We savoured every mouthful of that �4 drink and could not resist taking a cheeky photo! When asked where to eat on the Isle of Skye we still recommend the Three Chimneys restaurant and can't help but talk about the coffee! Anyway that's the coffee tale told and now back to the Three Chimneys restaurant review. 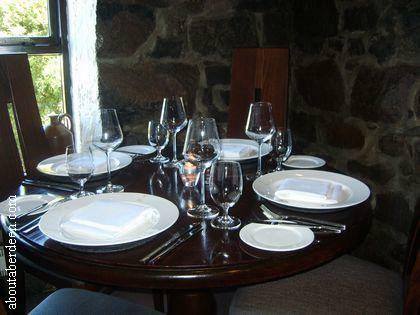 The menu at the Three Chimneys restaurant changes each day and is seasonal using local ingredients. We opted not to try the hot crab tart, grilled west coast cod and hot marmalade pudding that Nell Nellson was shown how to cook by co-owner and chef Shirley Spear during The Woman Who Ate Scotland. Instead we enjoyed the Three Chimneys seared breast of Perthshire wood pigeon with celeriac remoulade, crisp bacon, fancy kale and blackberry sauce which had a deep smoky flavour whilst being light enough to anticipate our main course. 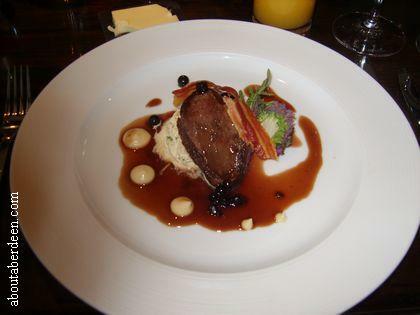 The pigeon was lovely and moist and the blackberry sauce sweet enough to compliment the taste of the meat. Other starters included Glendrynoch watercress soup, Skye shellfish bisque or Talisker cured Hebridean organic salmon with sweet and sour cucumber, nasturtium and beetroot relish. Our main course were the pan fried Mallaig monkfish and sconser scallops with crushed Totaig potatoes and courgettes, razor clam and hazelnut velout� and also the roast saddle of Lochalsh venison with golden pearl barley, young croft roots and greens with beetroot game gravy. We were a little disappointed that there was only one scallop on the plate but the generous piece of monkfish was compensation enough. 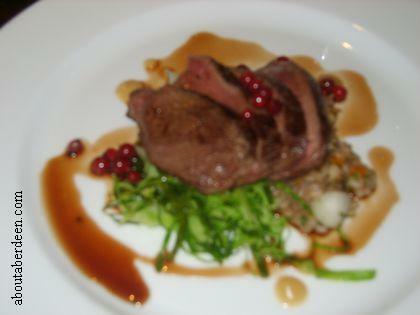 The venison was cooked to perfection at the recommended medium rare by the waiter and the pearl barley gave the meal a fine Scottish theme. The potatoes and vegetable portions came on the same plate and we felt these to be a bit on the small side, so much so that despite haven eating a three course meal (with �4 coffee and tablet!) we still had to seek out the Portree chipper by 7pm. But you do not come to a restaurant like the Three Chimneys for over stuffed tummies. Our meal was enough to savour and enjoy and will be remembered with fondness for many a year to come. Other main course available included baked Highland blue cheesecake with mustard leaf, apple and pumpkin seed salad, wild thyme and shallot dressing. The seafood platter for one was a �12 supplement per person and consisted of Loch Dunvegan langoustines, seared sconser king scallops, Loch Harport oysters, potted colbost crab and local winkles. Having seen the small portion of dark chocolate brownie with Black Isle raspberries, Issy's cr�me fra�che and chocolate fudge sauce that the opposite tablet received we opted for the Island Cranachan with Edinblane raspberries and shortbread made by Shirley Spear the owner and were not disappointed. This was the first time we have enjoyed this traditional Scottish recipe and are glad a professional chef cooked this Scots dessert which has oatmeal, whisky and honey. 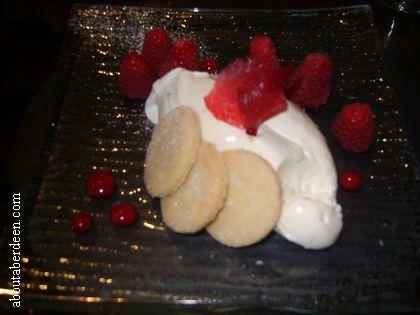 The cranachan was really refreshing on the palate, especially after two dark meats, and the cream was really light. 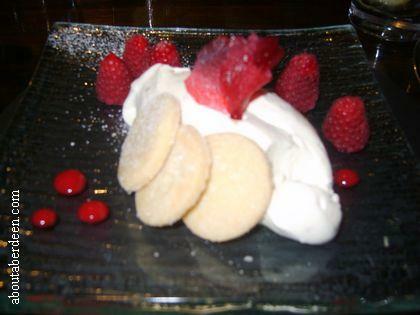 Other pudding choices included dark chocolate Amaretti Delice with Duntulm strawberries and white chocolate sauce or the famous hot marmalade pudding with Drambuie custard. A selection of Scottish cheeses with Three Chimneys oatcakes and chutney was available at a �3 supplement. 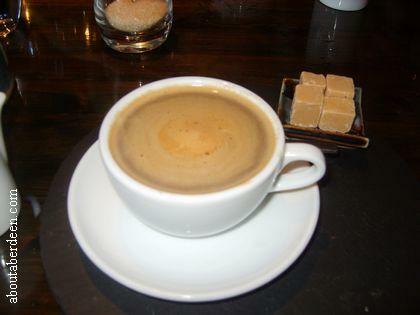 I won't discuss the coffee again, though did I mention it was �4! There was also Gaelic coffee with whipped double cream and Isle of Skye whisky or single malt or liqueur of your choice for �5.95. Children are made welcome at the Three Chimneys restaurant though they have no children's menu. Instead they are encouraged to try the normal menu and have their portions reduced. There were several children in the restaurant at the time of our visit for this where to eat Isle of Skye Three Chimneys restaurant review and they were warmly welcomed. The other tables seemed to be there for many reasons. Some were tourists and other came to the Three Chimneys to celebrate a birthday or wedding anniversary. Some were smartly dressed in suits and other more casually in jeans and t-shirts. There did not appear to be a formal dress code. The toilets at the Three Chimneys restaurant are found in the third dining area to the left at the entrance and were spotless. Rather than rough paper hand towels we were pleased to see single use soft cotton hand towels with a large wicker basket for their disposal for washing. There is no service charge at the Three Chimneys restaurant and we felt no rush to leave the restaurant. Our exit was as warm as the welcome we received from chefs and owners Eddie and Shirley, their head chef Michael Smith and their smiling team. Their Three Chimneys recipe book is for sale at the restaurant for �25. Opposite are the up to date Amazon prices with free delivery available. Three Chimneys recipes include their traditional marmalade recipe, their hot marmalade pudding and Drambuie custard recipe. Baking recipes which are served to guests at the House Over By include whisky fruit loaf and the Three Chimneys shortbread. Main meal recipes served in the restaurant are also included in the Three Chimneys recipe book and these include prawn and lobster bisque or grilled loin of lamb with leek and mushroom pearl barley risotto and wild garlic gravy. The opening times for the Three Chimneys restaurant are from 12:30 to 2pm for lunch and from 6:30pm for dinner though Sunday and winter opening times may change and it is best to check at their website threechimneys.co.uk which also has details and prices of the dinner menu. The Three Chimneys House Over-By does many special offers for seasonal stays including Christmas, New Year and Valentine's Day with Bed and Breakfast and evening meal inclusive of the price. There are six bedrooms at the Three Chimneys House Over-By which has five stars from the AA and VisitScotland. In 2009 Shirley Spear of the Three Chimneys Restaurant Isle of Skye won the Lifetime Achievement Award at the CIS Excellence Awards. The event was hosted by Sunday Post columnist Heather Suttie and Andy Cameron provided the entertainment. Other celebrity chefs at the CIS Excellence Awards included Michelin star chef Andrew Fairlie from Gleneagles.